Artist Karen Stober has multiple outlets for her creative spirit: as a visual artist, she has been painting and drawing for most of her life. As a musician, she plays the trumpet in several local bands, and was the “Silver Trumpet of Gondor” at the 2005 Lord of the Rings conference in Birmingham, England. Stober has been drawing and painting most of her life, with lead and colored pencils and oil and acrylic paints being her primary media. An avid gardener, her works reflect her love of nature. Stober also indulges in illustrations for all ages. 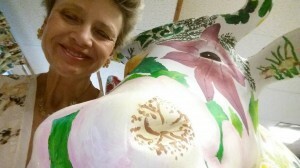 Her painted wood dog silhouette, “Floribunda”, was the “top dog” in Frenchtown, NJ’s Dogs on the Delaware competition in 2006, and her concert photography has been featured in many magazines. Stober earned her Bachelor of Fine Arts from Fairleigh Dickinson University and has continued to hone her craft by taking courses in graphic design, illustration and photography at Raritan Valley Community College.